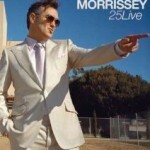 Share the post "DVD review: MORRISSEY – 25Live"
This live DVD was shot at the intimate Hollywood High School in Los Angeles to mark Morrissey’s twenty five years as a solo artist. It’s a fans set list including some Smiths classics like ‘Meat Is Murder’ and a rousing end to the concert with ‘The Boy With A Thorn In His Side’. His solo material is no mean slouch either with the instant pop refrain of ‘Everyday Is Like Sunday’ or ‘People Are The Same Everywhere’, which comes alive with his band who are at ease either in solo or Smiths mode. The stage show is minimal as it is all about Morrissey and his interaction with his loyal fans. He has that mystique both on and off stage that few front men have, a fact alluded to by Russell Brand who introduces Morrissey in the DVD bonus segment entitled ‘Grissle Bandage Presents Lord Mudslide’ (watch it to find out what the title is all about!). Extras wise there are four studio sessions recorded under the experienced eyes and ears of Tony Visconti, a treat for fans and Morrissey seems to nail the songs perfectly. The other bonus feature is a montage of pre-gig footage showing both front of house and backstage. Worth a watch but hardly essential unless you were in the audience and can spot yourself. Fans don’t need a review to persuade them to buy this and for a casual fan like myself I’d highly recommend this as a good dip into Morrissey’s band and solo musical highlights. This entry was posted in All Posts, DVD REVIEWS and tagged 25Live, DVD, Eagle Rock, MORRISSEY, review, the Smiths. Bookmark the permalink.